Lisa Goldman kicked off the championship weekend with a win in the $5,000 KindredBio Jumper Prix aboard Barbara Disko's Sovereign. 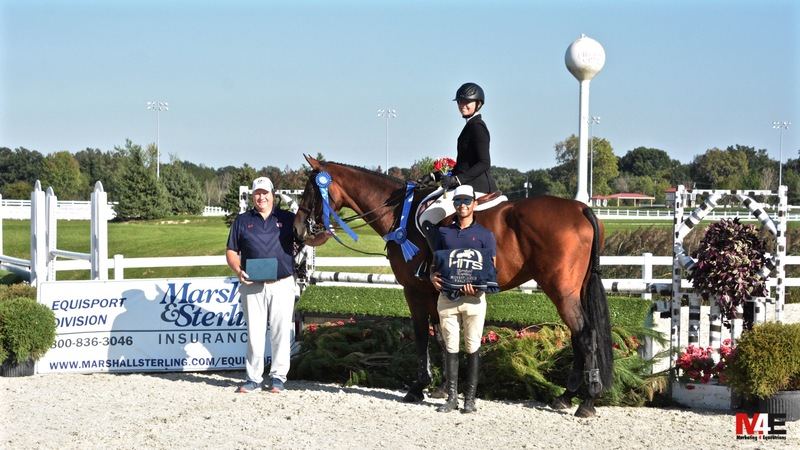 Crete, IL – September 14 – 2018 – HITS and Showplace Productions kicked off a major championship weekend where numerous awards will be presented for the Marshall & Sterling (M&S) Midwest Championships, the NCEA Midwest Medal Finals, the Zone 5 Horse of the Year Championships and the Illinois Hunter Jumper Association (IHJA) Medal Finals. Beautifully designed and decorated courses added to the special occasion starting with the $5,000 Johnson Horse Transportation Open Welcome with Annabelle Sanchez and her Incitatus earning the win in the first big class of the week. Lisa Goldman of Red Coat Farm and Barbara Disko’s Sovereign took the victory gallop in the $5,000 KindredBio Jumper Prix on Thursday, with Goldman then taking the top spot in the $5,000 M&S 1.30m Jumper Prix Final on Friday with Hindsight. 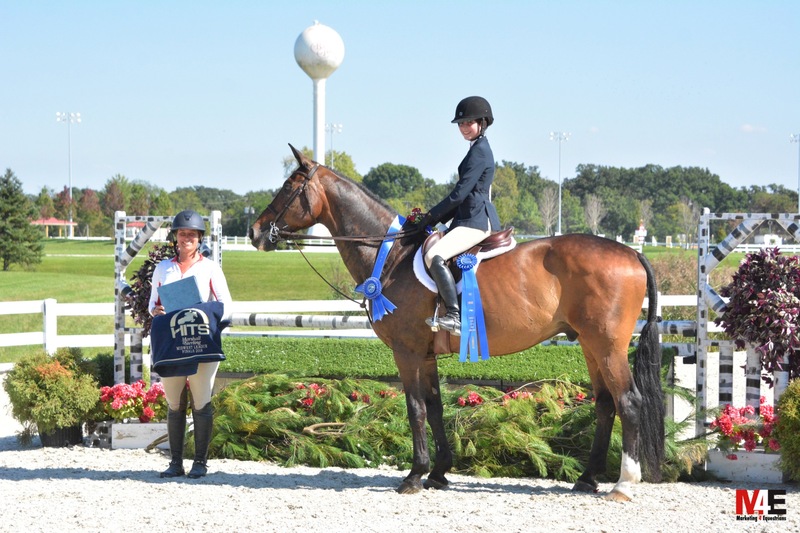 Ashleen Lee and Honor with Steve Foran accept the award for the win in the $5,000 USHJA National Hunter Derby. In the Main Hunter Ring, Ashleen Lee and her Honor, added a blue to the Freedom Woods banner in the $2,500 USHJA National Hunter Derby. Lee rode to the top of class with scores of 88 in round 1 and 84 in round 2 for the win. Winning today on Honor felt amazing! He is a special horse. He’s remarkably intelligent and has a big ego. Every time in the ring gets better and better – I’m lucky to have him as my partner. 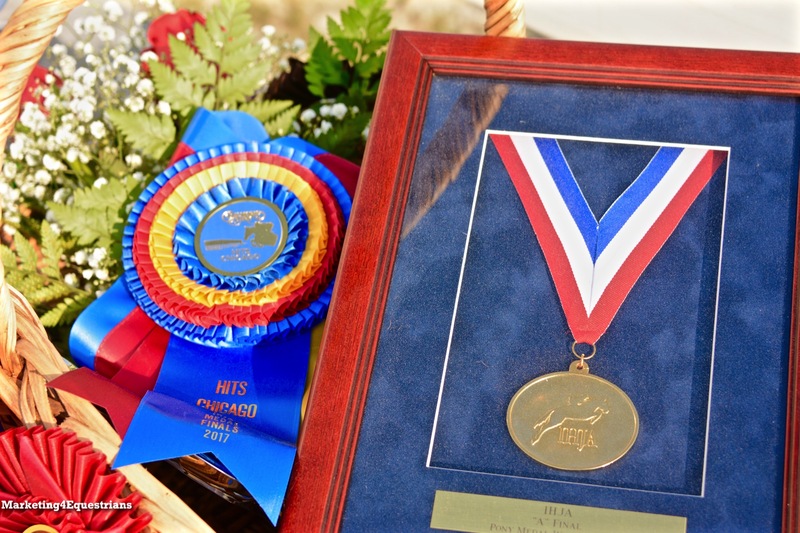 The annual IHJA finals offer our students a unique experience. All the different medal classes allow them to gain experience in the big ring early in their riding career. The stabling at Balmoral is exceptional. The footing and rings are great and we always enjoy Pat, Nicole and the Showplace crew. 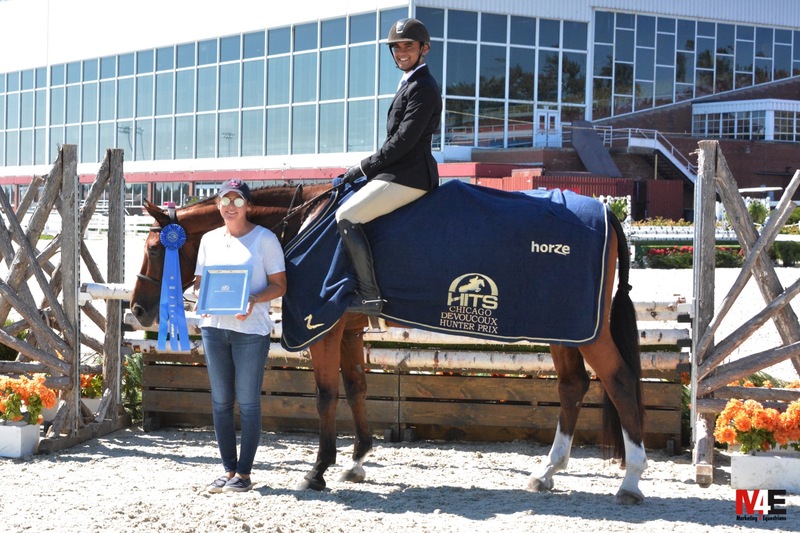 Melissa Hirt with Gabriel Rodrigues accept the award for Comtico's win in the $2,500 Devoucoux Hunter Prix. Gabriel Rodrigues of Northern Pines Farm, took the top spot in the $2,500 Devoucoux Hunter Prix with Comtico, owned by Golden Skyway Farms. Rodrigues earned an 86 in the handy round, combined with his 83 from the first round to clinch the win. Pat does a really good job and makes the courses harder in the finals here, which I think really helps with the other medals and indoors coming up. We did great here last year and look forward to this year. I started riding the horse not too long ago, he’s eight and super talented, he’s now getting more experience in the derbies with me and does the Children’s hunters and equitation with Ellen (Schmidt). He’s so dependable and is for sale, since Aristea (Santoro) is riding more young horses now. Emma Gutstein accepts the award with trainer Lisa Goldman for her win in the combined Dover Saddlery Adult and Back on Track Children's Medal Final. To wrap up the day, equitation riders showed for the coveted M&S medal finals titles. 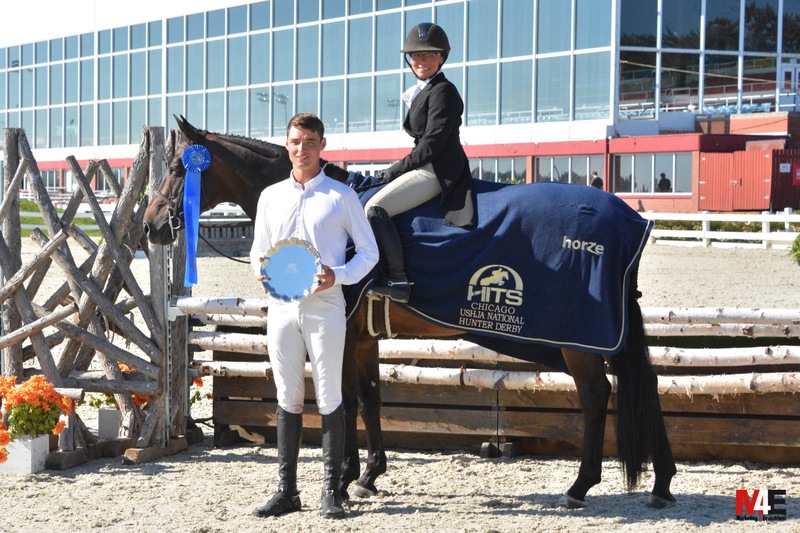 Winning the combined Dover Saddlery Adult and Back on Track Children’s Medal Finals was Emma Gutstein, 13, of Glencoe, Illinois aboard Jupiter. Gutstein rides with Lisa Goldman and Nina Hugi of Mundelein, Illinois took second place. Paige Matthies with Patrick Boyle and trainer Gabriel Rodrigues takes the blue ribbon in the M&S Junior Medal Finals. Paige Matthies, 17, of Lake Leelanau, Michigan, proved to be the best after the work off in the M&S Junior Medal Finals. Her stellar work off moved her from second place to the win on Barbara Smith's Blurred Lines. Maggie Bresch of Barrington Hills, Illinois, finished in second. I love it! It's like a second home for me! I got married here, we showed three weeks in May, three weeks in June, we were here in July, the honeymoon might be here too! I love it here! As always, Pat (Boyle) puts on an amazing show here with the IHJA Medal Finals and the M&S Medal Finals. He creates an atmosphere to help get you prepared for indoors with challenging courses and exciting work offs. The Championship weekend continues with the 2nd Midwest NCEA Junior Medal Finals, the $2,500 M&S Children's Adult Jumper Championship and the $25,000 HITS Grand Prix. For more information and a schedule of events, visit www.hitsshows.com.